Markets are telling us about themselves, not the economy. Certain aspects of markets feel like early 1999, volatility is spiking as leveraged low volatility trades blow up, and a bout of distressed selling is being misinterpreted as markets being warned about rapidly deteriorating economic fundamentals. Be greedy when others are fearful. Technicals can help us assess the extent to which the distressed selling and forced buying is finished, but when the US equity market normalises, multiples elsewhere can expand as the fear element also stabilises. Quality growth is cheap. As fears of a harsh cyclical downturn recede, structural growth stories, combined with much more attractive valuations should be the focus for long term investors. Leverage and illiquidity should be avoided and positive cash flow and strong balance sheets embraced. The final quarter of 2018 was a shocker for most hedge fund strategies and the industry overall had its worst year since 2011 according to Hedge Fund Research reported on Bloomberg1. Much of this came in the fourth quarter and led to a snowball effect as redemptions triggered further selling of crowded trades, which was all intensified in the thin markets of December. Interestingly, research from Sanford Bernstein2 points out that while correlations between stocks are elevated – as one might expect in a climate of forced selling (and short covering) – there was actually a dramatic rise in the correlations between stocks when grouped by factors, suggesting that factor based quant funds may have played a significant role in recent market instability. Such a period is often described as moving assets from weak hands to strong hands and investors need to recognise that the strong, unleveraged hands may value assets differently from the previous owners. In particular this can mean a preference for Value over Momentum. This is not to confuse value and growth, rather that at current levels, you can buy high quality at great prices, a better strategy for investors than buying beaten up low quality at bargain prices. That is better left to the traders. Currently, 2019 Outlook notes are all pretty gloomy, taking their underlying data direction from the grim fourth quarter. Indeed, last year was an overwhelming down year for almost every asset class as we can see from the following table. Using listed ETFs as a way of showing asset performance we can see that only one asset finished higher at the end of 2018 than it was at the beginning – which was cash. Table 1: 2018, a year when nothing worked. To compare the current feeling therefore to Q1 2009, while valid in some senses, is to exaggerate the scale. In fact, to me, there are many more are similarities to the start of 1999, when the market was similarly in shock from a very painful selloff in Q3 1998 as the giant quant fund Long Term Capital Management (LTCM) famously blew up, when its strategy, later described as ‘picking up nickels in front of a steam roller’ got hit by a black swan in the form of a default on Russian debt. Importantly it was not because they were long term Russian debt, it is that they were short term US Treasuries and using that funding to play a series of ‘safe’ carry trades, most memorably in Danish Mortgage Bonds. The problem was that when Russia defaulted, US Treasuries spiked sharply on a flight to safety and LTCM and their many clones rushed to close their short positions. This in turn meant they had to sell their ‘low risk’ assets, like the Danish Mortgage bonds, but unfortunately the low volatility that helped define them as low risk disguised a complete lack of liquidity when it came to trying to sell into what had been a one way market. Distressed selling triggered sharp price falls and ultimately liquidation and if at this point you are thinking that this sounds remarkably like the CDO crisis of 2008 you would be correct. A decade before the GFC, the flawed theory that risk could be determined by volatility without reference to liquidity and leverage failed spectacularly. The fact that we still use volatility as the primary measure of risk remains ironically one of the biggest risks in financial markets. More specifically, the ongoing widespread use of leverage and the pursuit of low volatility but highly illiquid assets in an illusion of a low risk strategy makes it simply a question of when, rather than if this will happen again. More immediately, for our look at the year ahead, the problem is that now, as back with LTCM, macro forecasters are creating a negative feedback loop, taking lower bond yields and equity prices as a forecast of lower economic activity and then plugging that lower growth into asset models arguing that the market needs to go lower still. If we look at US 10 year bond yields at the end of last year in Chart 1, we can see that they rallied over 20% in Q4, not because of a collapse in economic growth or even a flight to safety from a Russian default, but more to do with capital requirements for banks going into year-end – a policy requirement that also drove a tightening of liquidity at the short end. What is similar to the LTCM period, is that many people are looking at the fall in bond yields and the selloff in equities (down 20% over a similar period) and declaring that ‘the market is predicting a sharp fall in economic growth’ , even though it isn’t. These lower growth forecasts are then setting the tone for the downbeat 2019 Outlook notes. In a similar fashion, many are using the flat yield curve caused by the policy on bank capital as a predictor of a recession, even though it isn’t. As we discussed before Christmas, just because every recession has been preceded by a flat yield curve does not mean that every flat yield curve leads to a recession. The condition is necessary, but not sufficient. Back in Q3 1998 when I was still a sell side equity strategist, I had to listen every morning to my hyperbolic colleagues on the fixed income desk speak on the morning meeting broadcast system about “Economic Armageddon” (I told you they were hyperbolic) as the near 25% drop in US 10 year bond yields when LTCM unwound, was matched with a 20% drop in equity prices as forced buying triggered forced selling, with not an economic reason in sight – except in the fevered minds of the economists. Within a quarter, both markets had returned to the status quo ante and talk of recession vanished – only to return again in 2001 when the equity market corrected again – albeit from a level 60% higher! Paul Samuelson’s quip that the market has predicted nine out of the last five recessions was made back in the sixties, it is more likely now that would extend to something like nineteen of the last six, but the key point is to avoid using market movements as a forecast of the economy and in particular not to take that new forecast and put it back into models trying to predict the market. In this most recent instance the flattening of the yield curve, the rally in bonds, and the selloff in equities did not so much predict a recession for the economy as a recession for leveraged fund strategies. So, while acknowledging all the problems facing markets, much of it policy uncertainty in the ongoing economic trade war between the US and China, we should be wary of extrapolating market moves into economic forecasts and acknowledge the role of deleveraging and distressed selling. The problem now of course is to try and assess if the distressed selling is over. Technical analysis can be of some help here, I would like to see the bond yields break above some of those moving averages for example and the same with the various equity indices. 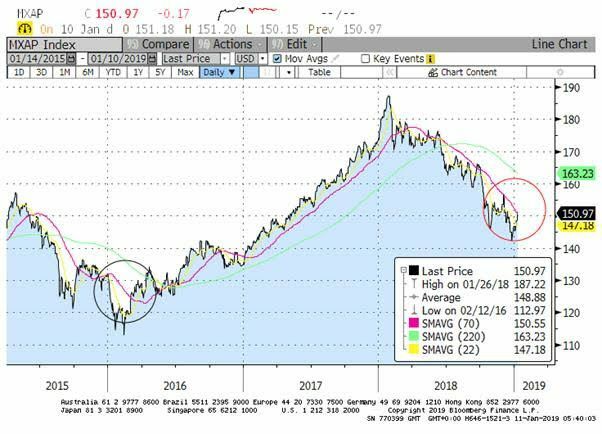 In fact, I believe this distressed selling has mainly been focussed on the US, with European and emerging markets having broken down back in the summer as asset allocators followed a stronger dollar narrative. Closer to home, therefore we need the US to stabilise rather than necessarily to rally. An absence of a negative should be a positive at these valuations. Chart 2 looks at the MSCI Asia Pacific index, which broke down technically much earlier than the S&P did, but is now turning positive. We can see that it has already broken the short term traders’ line and has just gone through the medium term Asset allocators’ line too. Note that it was when this broke to the downside in the first half of last year that we saw the big rotation out of emerging markets and Asia both driven by and fuelling a narrative about a stronger US Dollar. This in turn had been driven by bullishness about global growth and an expectation that the Fed would raise interest rates fairly aggressively in the year ahead. 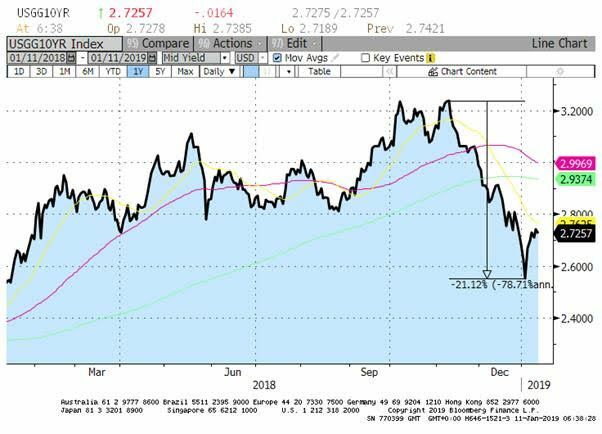 In Chart 3, we can see how the technical on the Dollar turned positive at the start of Q2, not coincidentally shortly before the asset allocators switched out of EM markets. Now we see the opposite technical position appearing. Technically, the US Dollar is rolling over and this is helping EM and Asian equities begin the year on a positive note and delivering something of a mean reversion trade. Outlook views often fail because they produce their own conflicting narratives. For example, a bullish set of markets at the end of one year tends to lead to optimism about the economy the next, making valuations stretched to the upside. Usually this also comes with higher US interest rate expectations and with the expectation of a stronger dollar and yet pundits’ positive views of emerging markets (benefits from stronger growth) are rarely tempered with concerns about a stronger dollar, which is not only fundamentally bad for emerging economies with dollar debt, but tends to trigger an asset allocation out of emerging into developed markets. So it was in 2018, excessive enthusiasm over China and EM growth based on strong 2017 market performance left valuations high, and expectations higher. 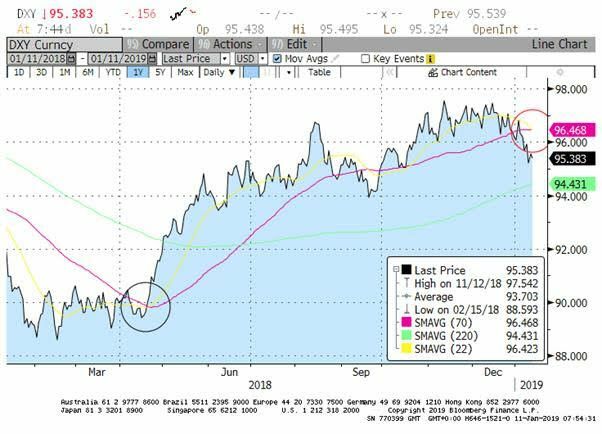 The reality of trade wars was ignored until a turn in the US Dollar triggered the asset (re)allocation mid-year, whereupon the bias swung 180 degrees. Conclusion. For Asia and emerging markets, flows often dominate fundamentals, and the key driver is often the US dollar. US dollar weakness in 2017 had driven great returns that year, but the dollar rally from Q2 2018 led to a meaningful rotation out of Emerging Markets, including Asia. This flow induced market weakness produced exaggerated concerns about economic growth that largely remain unfounded, but were further enhanced by the selloff in US markets in Q4. However, this looks much more like a 1998 style LTCM selloff as some highly leveraged strategies have been forced to unwind. Looking at technicals, it seems like both of these headwinds are fading or even reversing and this absence of negatives should be taken as a positive. Meanwhile, for much of Asia, growth remains intact and valuations are very attractive. This is not to be complacent about trade, nor to ignore policy risk at the stock and sector level, but we would see these increasingly as stock specific risks. Almost every equity market is cheaper than this time last year, but we would focus on quality and growth rather than oversold ‘poor quality’ stocks. As both the Western and the Chinese shadow banking systems continue to deleverage, we should be wary of low quality, poor cash flow and stretched balance sheets, however cheap they are. Instead we would continue to look for quality companies, with positive cash flow, sound balance sheets, and exposure to secular growth themes. Meanwhile as excessive worries over a cyclical sharp slowdown evaporate, value (as opposed to momentum), quality and growth should all be rewarded. We see no need to take credit or quality risk and would avoid liquidity and leverage risk, despite their popularity in certain product areas due to a misplaced emphasis on volatility. Indeed, as long term investors we would suggest that extracting the ‘premium’ from volatility and benchmark correlation ‘risk’ should be a strategy to be embraced rather than avoided. PS. It was interesting to read about the soon to be world’s richest divorcee, the current Mrs Jeff Bezos. We are used to describing people such as Bill Gates, or Warren Buffet as mega rich because of the notional value of the holdings they have in their companies, except of course they would not be worth the current price if they are selling a large stake. However, if Mr Bezos does have to pay out half his wealth, this means his wife will have $65bn of Amazon shares, a portfolio skew to a single stock that no Private Bank advisor would endorse. Thus this means an overhang to the shares one way or the other and also that by having that much cash, the former Mrs Bezos will become almost certainly one of the biggest private clients in history. All other data sourced by AXA IM as at Monday 14 January, 2019. AXA Investment Managers (AXA IM) is an active, long-term, global, multi-asset investor. We work with clients today to provide the solutions they need to help build a better tomorrow for their investments, while creating a positive change for the world in which we all live. With approximately €740 billion in assets under management as at end of September 2018, AXA IM employs over 2,390 employees around the world and operates out of 30 offices across 21 countries. AXA IM is part of the AXA Group, a world leader in financial protection and wealth management. AXA Investment Managers UK Limited is authorised and regulated by the Financial Conduct Authority. This press release is as dated. This does not constitute a Financial Promotion as defined by the Financial Conduct Authority and is for information purposes only. No financial decisions should be made on the basis of the information provided. This communication is intended for professional adviser use only and should not be relied upon by retail clients. Circulation must be restricted accordingly. Issued by AXA Investment Managers UK Limited which is authorised and regulated by the Financial Conduct Authority. Registered in England and Wales No: 01431068 Registered Office is 7 Newgate Street, London, EC1A 7NX. A member of the Investment Management Association. Telephone calls may be recorded or monitored for quality. Information relating to investments may have been based on research and analysis undertaken or procured by AXA Investment Managers UK Limited for its own purposes and may have been made available to other members of the AXA Investment Managers Group who in turn may have acted upon it. This material should not be regarded as an offer, solicitation, invitation or recommendation to subscribe for any AXA investment service or product and is provided to you for information purposes only. The views expressed do not constitute investment advice and do not necessarily represent the views of any company within the AXA Investment Managers Group and may be subject to change without notice. No representation or warranty (including liability towards third parties), express or implied, is made as to the accuracy, reliability or completeness of the information contained herein. Past performance is not a guide to future performance. The value of investments and the income from them can fluctuate and investors may not get back the amount originally invested. Changes in exchange rates will affect the value of investments made overseas. Investments in newer markets and smaller companies offer the possibility of higher returns but may also involve a higher degree of risk.